The post consists of an e-mail exchange between Thayer and an Atlantic editor, where Thayer is asked if he would repurpose a previously published piece for the Atlantic’s website. He is not offered any money, but is told he will gain exposure since Atlantic’s site enjoys 13 million readers per month. For those familiar with the online world of publication, this exchange is hardly surprising or unusual. If you scan the posts at Who Pays Writers, you’ll see that $0 or maybe $50–$100 is common for very well-known sites. In fact, the more traffic a website gets, the more it can avoid payment by offering the carrot of exposure—which is indeed valuable and needed for some writers, but not all. Frankly, I will refrain from being insulted and am perplexed how one can expect to try to retain quality professional services without compensating for them. Let me know if you have perhaps mispoken [sic]. Thayer’s post spread quickly via Twitter on Tuesday, with Atlantic editor Alexis Madrigal (@alexismadrigal) coming to the defense of Atlantic Digital. However, Madrigal is NOT the editor who was involved in the e-mail exchange above; he works for a different “channel” of Atlantic Digital, but is one of the most prominent and (in my mind) admirable editors involved with the digital side of the Atlantic, which operates independently from the print side. The discussion started to come to a close with these two tweets about the state of online journalism, which Madrigal argued was tough, but not depressing. UPDATE (Tuesday, 4 p.m.): The Atlantic has posted an official statement on the matter, from James Bennett, editor in chief. From the perspective of the writer: If a piece of my work were solicited for The Atlantic, and I were offered no payment—just exposure—I’d take it. At this stage of my career, it’s an attractive offer if the material is already written. Was it a good deal for Nate Thayer? Based on his career profile, it’s easy to see why he said no. Every writer can make a different decision and still have it be the right decision. From my perspective as VQR web editor: (1) I have been taken to task on Twitter (at least indirectly) for VQR’s payment for online work, which is $100 per post. A freelance journalist told VQR (on Twitter) that pay rate is insulting. For an original, in-depth reported piece, I agree. However, $100 is not a one-size-fits-all pay rate. It varies from writer to writer and piece to piece. (2) Strong online writers, with something unique or meaningful to say—who also drive traffic—are not easy to get. They are in high demand. And I would pay well for their work if they came to me, but they are not (even when solicited). I believe that is because VQR doesn’t offer sufficient exposure, plus our site is cutting edge only if you’re an online writer from 2004. So writers: Don’t tell me exposure or platform doesn’t matter. I know it does—just like relationships and networking matter. (3) VQR is still print-driven, at least to the extent that it probably shouldn’t even have a full-time web editor position. Nine months in, I have barely begun to solve the dilemma of what our online content strategy ought to be given the limited resources we have (both time and money), but I can already see that continually sourcing freelance content for online is not optimal, possibly detrimental. From the perspective of a publications leader (who once provided a vision for a brand): I hope there can be a compromise, somehow, between having a decentralized structure for Atlantic Online, but still having some brand consistency or philosophy in how content is sourced and pushed out. Must these two things be mutually exclusive? My idealistic side wants to say no—unless the various channels at Atlantic are SO different from one another that they absolutely must work under different business models. But I doubt this is the case? From the perspective of someone who has long worked in publishing: I know few people, if any, who go into publishing (or journalism) for great pay. It’s usually about love, passion, a particular set of values, and the resolve to do something that’s very hard, not well paid, but ultimately rewarding in other ways. Some writers have chosen the freelance game, the same way others have chosen to work on the inside, for a regular paycheck, and (again, expressing my idealism), I believe there’s a shared set of goals. It’s far more productive to work together than to launch full-scale attacks, but that’s not to say we should hold back on constructive criticism or an idea exchange of how things can work better. For-profit publications that are (on the whole) ethical, transparent, and respected probably have the hardest time of all finding a sustainable business model. What do we gain by trashing them? This is a complex and controversial issue, something that we discuss every week at my UVA class in digital media and publishing. I welcome discussion and comments below, but let’s avoid black-and-white declarations or finger pointing. I’d love to hear about particular online publications, websites, or outlets that you think are getting it RIGHT. To read a phenomenal exchange on this issue—among career freelance writers, editors, and other media insiders—visit this Branch conversation. Finally, in a somewhat flip piece, but also important: “How Have You Devalued Professional Writing Today?” by Mark Armstrong (Longreads) helps everyone think more broadly and deeply about the issue. Posted in Electric Speed, Publishing Industry, Work-Life and tagged content strategy, magazines, online content, online publications. Much appreciate the comment, Joe. Definitely agree with you on the nonprofit front. That’s never a good reason for anyone to ask you to work for free. I object to the nonprofit statement. First of all, MANY nonprofits – including several large, mid-sized and small members of the Investigative News Network – employ freelancers and pay for their services. That said, nonprofits are inherently mission-driven charities for the public good. Volunteerism is a key component of charity work. Tarring a growing and increasingly vibrant sector of the journalism field isn’t going to help anyone in this conversation. I support volunteerism & charity work as much as the next person, but I don’t think it serves nonprofits to actively solicit a professional’s work on that basis. If it is volunteered or freely offered, that’s a different story. The journalism nonprofits I’m familiar with go to great lengths to *fund* great reporting. Thanks, Kevin. I appreciate your perspective here. I should point out that I work for a nonprofit (VQR) that pays for reporting; VQR also benefits from other nonprofit organizations who fund our reporters. It wasn´t a hundred dollar deal, dude. He was being asked to do it for free. I understand there are many perspectives, the writer’s, the editor’s and the publisher’s, but for as many as they are, the very core of the problem is that a writer, at the end of the day, needs to eat in order to survive. Indeed, we all have to eat; we all have to survive. But I don’t find this any more a compelling argument than saying, “Musicians need to eat in order to survive,” or “Artists need to eat in order to survive.” No one is entitled to make a living off their writing (or art). I don’t think publishers are cheap; I think they are acting rationally given the current market of abundant and free content. If you read some of the analysis by Felix Salmon at Reuters, or Alexis Madrigal’s response today, you can see this has little to do with greed. It’s about survival. If a writer is not being offered a living wage for what he is writing, maybe it’s time for him to change who he is writing for, or what he is writing. I don’t see this as a tenable response. Editors are not entitled to a polite “No, thanks” for asking for a writer’s work for free, even though you advocate that. 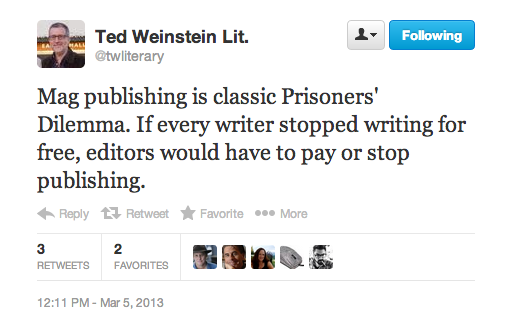 To impose a writer not being “entitled” to make a living as justification for a major publication offering zero dollars is highly problematic in comparison. This case not beginning to apply the heavy disparity between the importance of being polite and the importance of paying a workforce. I appreciate your round-up here very much, but don’t see how you arrive at some of your conclusions. Several weeks ago (maybe longer), Madrigal tweeted to ask why any professional writer would write for Medium (he was addressing Robin Sloan). I don’t see why he questioned people writing for free on Medium but thinks writing for free for The Atlantic is any different. I, too, am trying to figure out why people write for Medium. It feels like a fancy, gated form of Blogger or WordPress that trades on being exclusive or exclusionary. I wouldn’t put any credibility in a writer with a Medium byline, but I would pay attention to an Atlantic byline. My highest-paid writing assignments have come from small colleges that offer little in terms of exposure. My lowest-paid writing assignments (all $0) have come from The Huffington Post, The New York Times and TIME. The key, I think, is to balance the two (high pay vs high exposure). The goal, of course, is to achieve both in one assignment (high pay + high exposure). Still working on that last one. Agree, there’s a balance to be struck. Peter, I find that experienced journalists like yourself are pretty angry at the change happening; I don’t think it’s a coincidence that it was a longtime career journalist (Thayer) who sparked off this debate. While I know the ongoing change is going to result in a lot of damage (closed publications, ended careers), I have faith and optimism that journalism will come out alive and healthy, and there will be a new generation of journalists who know how to play the game and get paid a living wage while doing it. Chuck this noise, Farley. I’m gonna make another zine. [The Freelance Life] On Writing for “Exposure” — And How to Just Say No. I’m forced to agree that the payment issue should’ve been discussed upfront. That said, I have considerable sympathy for the editor, who was only 2 weeks into her job. It’s too bad The Atlantic wasn’t able to better protect her from such missteps. As far as The Atlantic making a second apology … I’m skeptical that fixes anything. The Internet is rarely satisfied with apologies in these situations (see Paul Ford: https://medium.com/fords-sensorium/30966f578ebf), and I’d argue the situation would still be fervently debated even if the editor had offered immediate and upfront disclosure about payment terms.